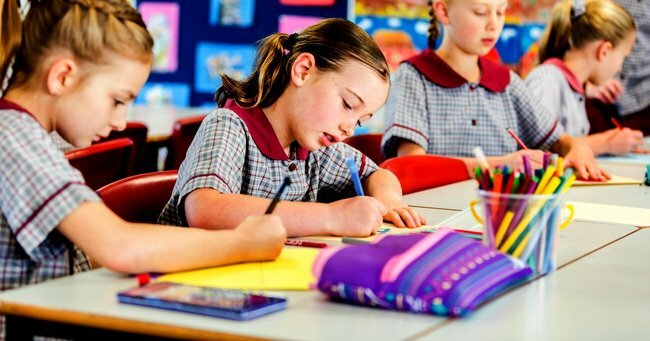 Parents can calculate changes after Australian school funding cuts. Want to know if your child's school will be better off? Here's how to find out. Parents can now do the maths on exactly how much their children’s school stands to win – or lose – under the Turnbull Government’s new funding plan. Ahead of issuing the federal budget containing the funding changes, the government released its online schools calculator on Tuesday. Watch: Bec Judd talks about her son and daughter going to school and kinder. Overall, the government plans to boost its share of funding from $17.5 billion in 2017 to $30.6 billion by 2027, with the aim to bring all schools to the same needs-based per-student level once state government cash is added. The government figures confirm 24 independent schools will have their funding cut in real terms over the next four years. They also show 27 Catholic schools in the ACT will join them – although the government says transitional funding will be made available for these. However, out of the nation’s 9400 schools, all but 251 will have their funding grow by at least 2.5 per cent, with 4500 getting a more than five per cent boost. “We’ve been open and upfront all along that more than 9,000 schools are set to receive significant funding boosts according to their need but that also means some schools will have their funding levels frozen or reduced,” Education Minister Simon Birmingham said. The data has already been given to the states and territories and non-government schools. The detailed figures come as the Catholic schools sector lined up against the government’s plans, with strong support from federal Labor. The ACT Catholic system is especially strident in its opposition, estimating it will have its funding cut by two per cent in the new deal. Listen: What is year 12 really like? Zoe Mallett shares the highs and lows of her final year of school. Hundreds of Canberra Catholic school parents attended a meeting on Monday night to learn about the changes. Junior frontbencher Zed Seselja, the ACT’s only federal Liberal representative, told the parents he had put their case to Senator Birmingham very strongly. “My commitment to you tonight is to continue to push for that with the minister to get the best possible deal for the ACT,” he said. He is a proud product of Canberra’s Catholic school system and his own children are enrolled in it too. The local ACT Liberal opposition also told the meeting it thought the commonwealth’s offer was not a good deal for the territory. Schools that will lose money. You can find the online school funding calculator here.